HG Salutes: A BERRY Delicious Item! Celebrating today's honoree is such a no-brainer, and yet it hadn't occurred to us until now to give it official props. Fresh or frozen, it's always fabulous. Of course we're talking about the one, the only, the most popular berry in all the land... THE STRAWBERRY! Today, strawberries, we at HG salute you. "Fragaria × ananassa, commonly known as strawberry or garden strawberry, is a hybrid species that is cultivated worldwide for its fruit. The fruit (which is not a botanical berry, but an aggregate accessory fruit) is widely appreciated for its characteristic aroma, bright red color, juicy texture, and sweetness. It is consumed in large quantities, either fresh or in prepared foods such as preserves, fruit juice, pies, ice creams, milkshakes, and chocolates." WHOA. While the above Wikipedia description is accurate, it's missing one key bit of info: These juicy things taste FANTASTIC! Read on for more HG input on the matter... including loads of recipes, of course! Full of Vitamin C - Citrus, take a seat. 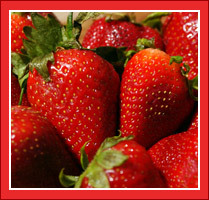 A cup of strawberries has well over 100 percent of the daily value of vitamin C, a.k.a. a super antioxidant! 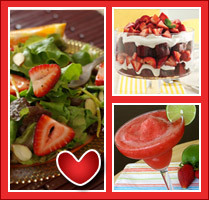 Heart Healthy - Strawberries contain lots of phytonutrients. This makes them serious powerhouses when it comes to cardiovascular well-being. Love that! The Freezer - Whether you wanna whip up a super-easy smoothie or a tropical frozen cocktail, a bag of freezer-aisle unsweetened strawberries is a phenomenal ingredient. Frozen berries last longer than fresh ones (obviously! ), and they're generally cheaper. Plus, their texture is perfect for blended beverages. HG tip: Let the berries thaw a tad before you fire up the blender. Sweet Breakfasts - We adore these berries in the morning! Their super-filling nature makes them ideal for a first meal. Going a step beyond the classic (strawberries in your cereal bowl), this parfait is easy and amazing. And if you want to go all out, this towering plate of French toast should do the trick! 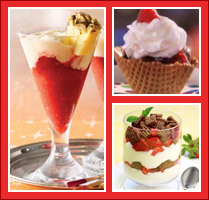 Fruity Desserts - Who doesn't crave strawberry sundaes and strawberry shortcakes? We love 'em, and our berry-licious desserts run the gamut. (See Hungry Girl 200 Under 200 Just Desserts for proof!) Craving something simple? Just dunk the fruit into a sugar-free chocolate pudding snack. Wanna show off? This pair of parfaits may be our best date-night dessert recipe ever! Stuffed-with-Love Strawberries - Imagine big ol' berries overflowing with sweet 'n creamy filling. Yup, that's what we did here! Ginormous Fruit Salad Surprise - Probably the most fun you'll have eating fruit salad. The serving size is HUGE! Slammin' Slimmed-Down Strawberry Daiquiri - With summer just around the corner, you'll wanna bookmark this refreshing adults-only recipe! Cheesecake Flapjack Stack - Who says you can't have strawberry cheesecake for breakfast? Not us! Berry 'Nana Oatmeal Parfait - Pssst... Ever tried chilled oatmeal? Give it a whirl with this recipe! PB&J Yogurt Parfait - In this TV-famous recipe, the part of peanut butter is played by PB cereal and peanut butter baking chips. Fresh strawberries get an assist from s-berry yogurt! 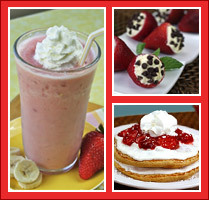 Banana-Berry Cloud - A sweet and creamy swap for a heavy blended beverage. Frozen strawberries + frozen bananas + blender = FUN TIMES. Don't hog the strawberries! Click "Send to a Friend" to share this info now. Today, May 17th, is National Cherry Cobbler Day. Yes, we rebelled and honored strawberries instead. What are you gonna do about it, cherries? Okay, okay, here's some cherry love: our Cherry Cobbler Parfait!